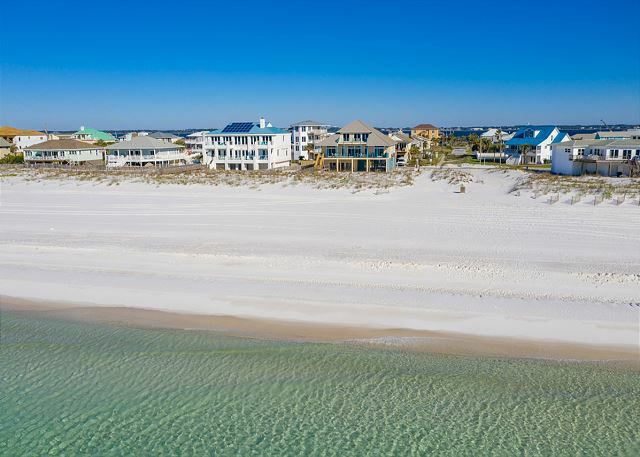 This luxury, Gulf front home is picture perfect, inside and out. With five-bedrooms, five-baths, and 3608 square feet, 1214 Ariola Drive can sleep up to 17 people very comfortably. The ground level entry-way is light and bright, with stairs leading up to a large, open great room with main level living, kitchen and dining area. The spacious living area has lots of comfortable seating. including a queen sleeper sofa. The modern kitchen features granite counter tops, stainless steel appliances and prep island with two bar seats. The large dining table is great for family style meals. Bedroom 1 is located off the living room and offers a king bed and sleeper sofa. 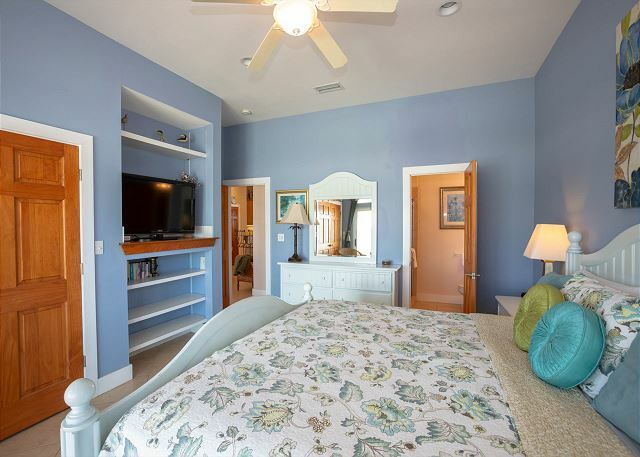 This room opens to the gulf side deck and has a huge, private bath with walk-in closet, double vanity, separate tub and over-sized shower. Bedrooms 2 and 3 are located on the opposite side of the house. 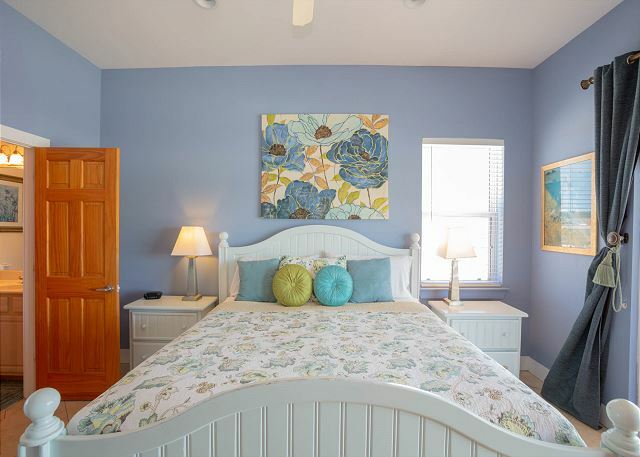 Bedroom 2 has a king bed, flat screen TV, private bath and opens to Gulf side deck. 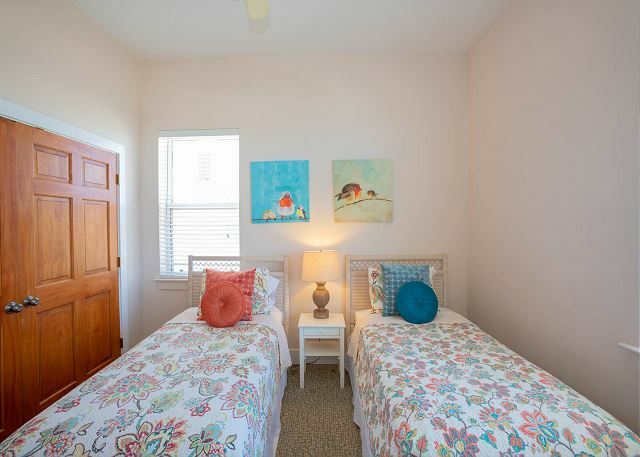 Bedroom 3 has a queen and twin beds, private bath, and opens to the street side balcony. Bedroom 4 is off the kitchen, has two twin beds, opens to the street side balcony, and uses the large hall bath that also services the kitchen and living areas. 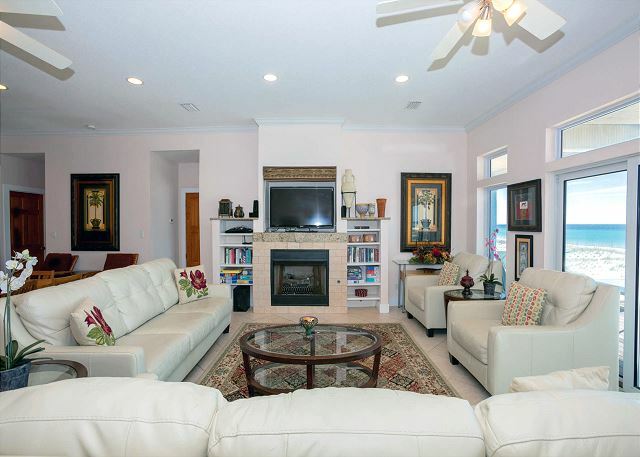 The upper level offers another nice living area with a sleeper sofa and access to a second Gulf side deck. There is an additional master bedroom on this level, also opening to the upper deck. 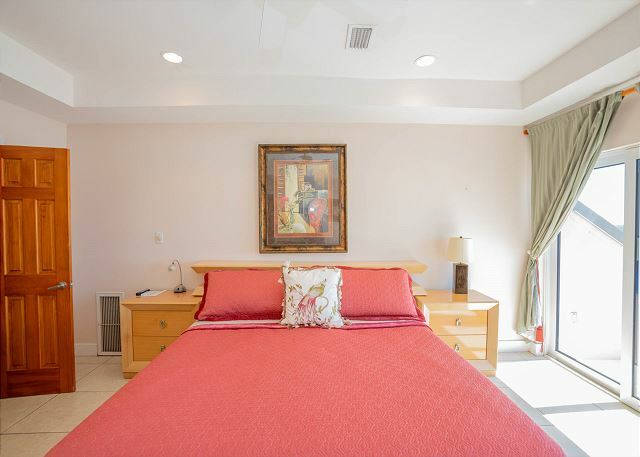 This beautiful master suite has a king bed and a huge bath with walk-in shower and Jacuzzi tub. 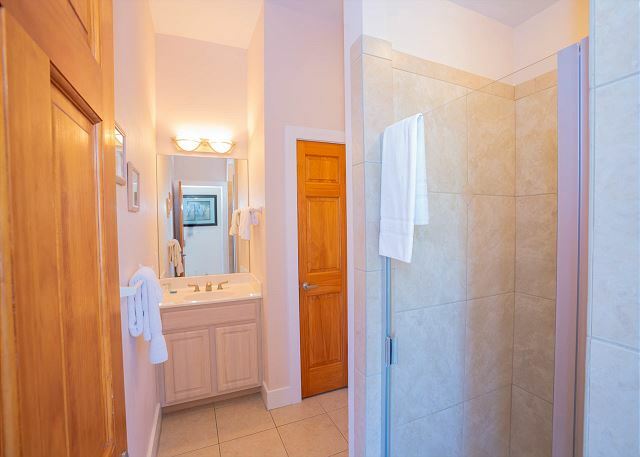 The bath of this suite has a door opening to service the upper level living area. The outside amenities of this house cannot be matched. 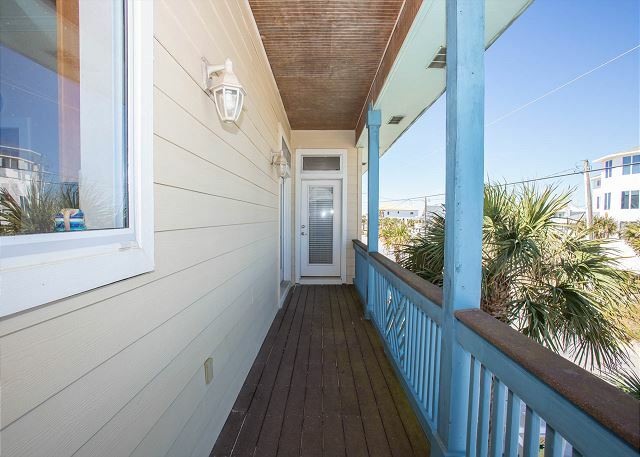 The main level covered deck area has a fabulous outdoor sink by the grill, two full-sized dining tables, and leads down to a private boardwalk with access straight to the beach. Under the house is more outdoor living space, a private outdoor shower, covered parking and garage. The lower level also has a bonus room with Foosball table, ping pong and game table and sliding glass doors that open right to the beach. A great place to retreat with the kids and grandkids !! We were fortunate enough to secure this rental at the absolute last minuted possible due to the hurricane that hit Panama City. Super place to stay -- modern and updated accommodations -- will definitely keep in in mind for the future. We're so glad that you enjoyed your stay at 1214 Ariola Drive under the circumstances which brought you here. We appreciate the time you took to post this review and we hope to see you again very soon! We loved the house. The layout for our family , 8 adults and three children and a infant worked very well. This home was well maintained. Patio door sticks and not closing perfectly, but since we live on a lake knew that was normal from water and wind from gulf . Kitchen had lots of dishes and glasses. Will definitely rent again. We are so glad to hear you enjoyed your stay at Ariola 1214 and look forward to seeing you again on your next trip to Pensacola Beach! I don't have anything but nice things to say. The house was absolutely wonderful. The express check in (day of Blue Angles) was great. We arrived around 12:30 and the house was ready for us, oh what a plus!!! Even though I have been coming to Pensacola Beach for 40 plus years, this was my first time renting from Paradise Rental. You guys do a great job and look forward to seeing you next year. Thanks for making my trip great!!! We rented this property for our sons destination wedding on the beach. It was perfect for our family! The house was in great condition and very clean. The staff at paradise beach home rental was very helpful in finding a home for our needs and with anything we needed while we were in pensicola beach. 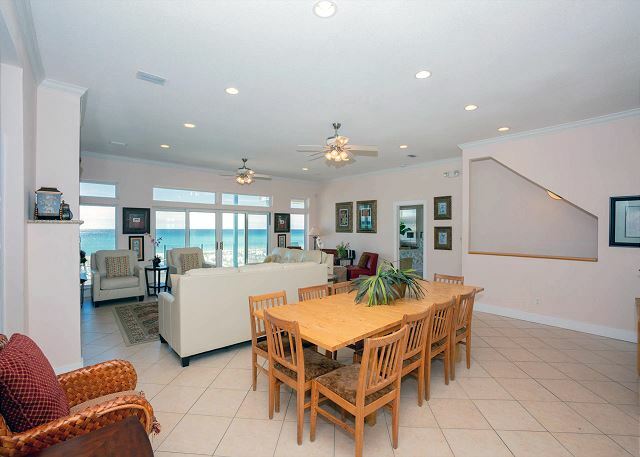 We would recommend them and this beach house to anyone! My family of 13 (6 adults and 7 kids} stayed a week. The house was very spacious and comfortable for everyone. The location to town was great and to be directly on the beach was awesome!! The house was clean with ample furnishings. The only thing I could suggest would be to replace some of the broken patio furniture,maybe grease or realign several of the shower doors and although we didn't use it, I would have liked to, the jacuzzi tub in the top room did not work. To me those were not major issues, but to some it might be. We will definately stay again! Beautiful location, Well functioning house. Given the advertised capacity, The supply of cooking materials was deficient. The supply of towels was inadequate. The gas grill needs to be serviced. The valves malfunction. We've rented a number of beach front houses and this one has the best layout. (We miss the one with elevator...but not available for rent anymore!) Stove is awkward, even for a beach house. Mostly clean except the floors. Our feet were jet black after a few hours of walking around bare footed in it, but this is not the first time we've found that: house with elevator had dirty floors too. AC: good. Hot water: good. Mattresses about ready for replacement. A good time with our Paradise Beach rental as always. Gift bag is a nice touch! Left a short maintenance list with staff upon check out. This was a great house! There are comfortable beds for 11. The upstairs den is almost another private bedroom with a sofa couch so we slept 13 comfortably. 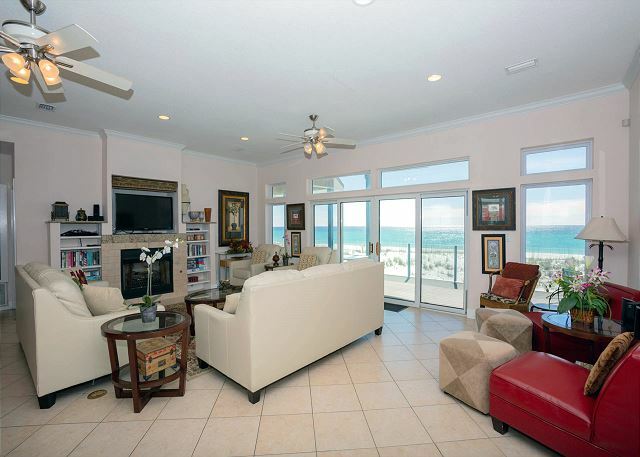 The main level has a spectacular view of the gulf along with a private boardwalk over to the beautiful white sandy beaches. The downstairs gameroom is somewhat stuffy with no AC but it works great for coming in off the beach. There's a fridge downstairs for cooling your beer and refreshments for the beach. 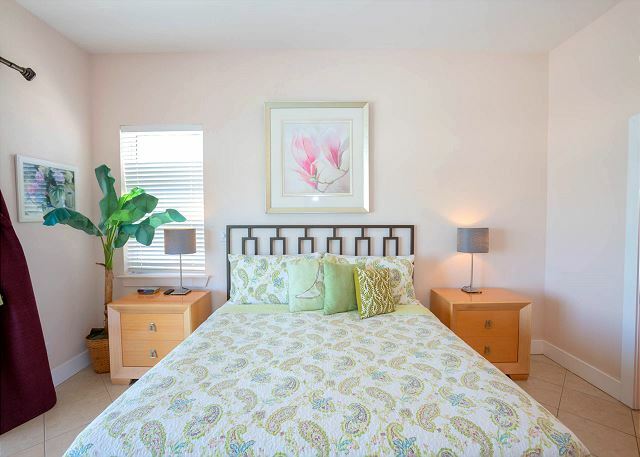 Paradise Beach homes was fast and courteous to assist on anything. Great experience. Will rent again. We had a wonderful time. The house was very spacious and the furnished very comfortably. Wonderful location as it was a minute from the ocean. We had a 5 and 2 year old and could let them play in the sand behind the dunes while we watched from the desk. Great time. We had our wedding at this home and it was perfect! The house was gorgeous! It accommodated sleeping areas for the bridal party. It made for great pictures for getting ready, the ceremony, and the reception. We loved that it has its own private beach and pier that separates you from the public beach. I can't wait to stay there for anniversaries to come! Rented this house for a large family gathering. The lay out of this house is perfect. Private areas for extended family. Game room was a hit with the small kids. Location is breathtaking! Living room large and comfortable and dining area spacious. We will definitely rent this property again. We rented the beach house for an extended family vacation. The house was in a perfect location. There is enough room for everyone to have space! We had between 10 and 14 people at any given time. My only complaint was the 1st 2 nights the 3rd floor was not habitable. The AC was out and it was over 85 degrees. Paridise Homes management group was helpful, unfortunately, the ac company had to come out Sunday and Monday before the issue could be fixed. Good thing we brought air mattress just in case. Once they actually fixed the problem everything went smoothly. My wife's four sons their wives and their five grand children and I had a fabulous week. The weather was perfect. Mornings and afternoons on the beach splashing on the surf, ping pong tournament evenings, dinners cooked on the gas grill all added to the weeks enjoyment. The layout accommodated everyone with great comfort, the deck, game room and ramp direct to the beach made this a perfect choice. The grill that was inoperative the first night was replaced with a new one the next day. The A/C on 2nd floor went out but was fixed promptly. The property managers were very responsive to our needs. We had the whole family down from Baton Rouge for the week. The weather was beautiful with a breeze blowing almost all the time. The water was red flagged the first two days then the water was fine for everyone. grand kids (2) enjoyed playing in the sand and water. The house was wonderful. The porch is the best thing that I like about the house. Its big enough for everyone to hang out on after a long day at the beach. How to return next summer! We had a few issues when we first arrived - the security system beeped constantly until we were able to disable the system. The grill was not usable, but was replaced the next day. The game room was locked, but was unlocked the second day. our family with 5 adults and 4 grandchildren had super time with such a gorgeous view and private walkover! accomadations were great! Blue Angels from the Beach!!! Very good. Negatives, dryer vent stopped up, dresser drawer off track, not properly keyed upon arrival. Positives, very well equipped for cooking, nice outside shower + great game room. Really enjoyed our stay and would stay in this property again! Paradise Homes was very easy and accommodating to book and stay with from across the country. The house was exceptionally clean on a beautiful beach.